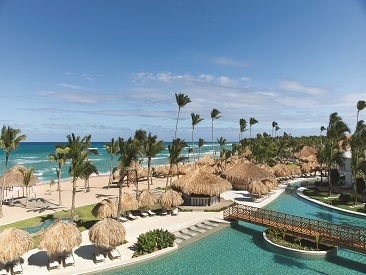 Excellence Punta Cana is an elegant, all-inclusive, adults-only (18+), all-suite resort, located with a beachfront view of the beautiful Dominican Republic. This resort is a romantic getaway for couples seeking a different kind of vacation. Far from crowds and nestled in a forest of coconut palms, on a remote stretch of Punta Cana shoreline, this resort is perfect for an intimate getaway to paradise. Offering unique amenities, such live stage shows featuring Latin American music and dance, Excellence provides the perfect playground for an escape in private, romantic paradise. Excellence Punta Cana is an elegant adults only (18+) all-suite all-inclusive Colonial style beachfront resort with 462 beautifully appointed suites. The resort is a romantic getaway for couples that want a different kind of vacation. The resort is far from the crowds, nestled in a forest of seven thousand coconut palms on a remote stretch of Punta Cana's crystalline Caribbean shoreline.Vacations here are peaceful, but never dull. Excellence offers live stage shows featuring Latin American music and dance. Excellence provides the perfect playground with two giant pools including swim-up bar and poolside meals under palapas. The world-class spa and fitness center give guests an opportunity to keep up with their workout schedules and pamper their bodies. Dine in ten different restaurants with cuisines from around the world, and enjoy ten bars ranging from elegant to swim-up. All finely appointed suites offer superior amenities including king beds, private patio or balcony, full marble bathroom with a jetted whirlpool bathtub, separate shower, separate water closet and double vanities equipped with hair dryer, scales, vanity mirror, VIP toiletries, bathrobes and slippers and phone. Every room features a CD/DVD player along with a well-stocked mini-bar and the convenience of 24-hour room service. Representing the ultimate in luxury, privacy, exclusivity and service. All of the Excellence Club suites offer impressive views and certain room categories include both indoor and outdoor jetted tubs. 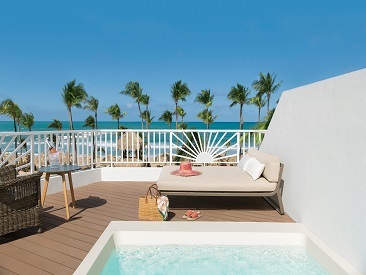 Excellence Punta Cana Reopens Its Doors! 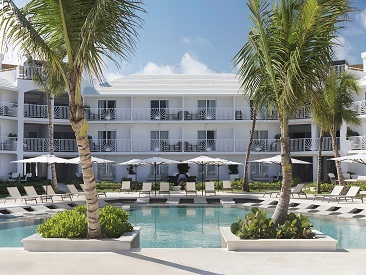 Excellence Punta Cana, the all-inclusive resort from luxury hospitality leaders, Excellence Group, has reopened its doors following a four-month, $45 million dollar renovation. Maintaining the resort’s original romantic island charm and elegance that earned it a spot on Trip Advisor’s ‘Top 25-All Inclusive Caribbean Resorts, the property now also features completely renovated and new onsite food and beverage offerings, an upgraded Club Lounge resulting elevated front desk and concierge service, a new beachfront pool, in-room renovations with improved layouts, new furniture and sleek Caribbean vibes.